Scooper - Technology News: Will North Korea's nuclear ambitions provoke a new arms race? Nuclear and missile developments in the Korean peninsula have been the focus of global attention, not only because of North Korea’s tests, but also its repeated threats against South Korea, Japan and the United States. North Korea was briefly a member of the Nuclear Non-Proliferation Treaty (NPT), from which it withdrew in January 2003. It has subsequently conducted five nuclear tests. And there are fears of another one impending. North Korea is also continuing to expand its missile program, conducting very frequent tests. Pyongyang’s testing of an intercontinental ballistic missile ( ICBM ) on 4 July sent shockwaves across the globe. The Hwasong-14 , a modified version of the Hwasong-12 missile tested on 14 May, flew about 930km and for about 37 minutes, and finally fell into the Japanese exclusive economic zone in the Sea of Japan. David Wright, of the Union of Concerned Scientists, estimates the missile could reach around 7,000km on a standard ballistic trajectory. The growing range of North Korean missiles, now reaching up to Alaska, is a serious concern for the US. North Korea’s continuing nuclear and missile tests are clearly the most central issue. Not even the closest analysts of North Korea seem to have a clear idea about how many nuclear weapons the country has developed or is capable of developing, or even technical parameters such as whether the country has solved the problem of miniaturization of its nuclear warheads to mate one successfully to its ballistic missiles. North Korea claimed that it had, after the fourth nuclear test in January 2016. US military officials also suggest that Pyongyang may have managed miniaturization, though US civilian officials appear to be more skeptical. There is some debate about how North Korea plans to use these nuclear weapons, and especially about its nuclear doctrine. North Korea recently paraded a whole bunch of new missiles, reflecting the growing capabilities in terms of range and overall sophistication. Such nuclear and missile activities are a direct threat to South Korea, most obviously, but also to Japan. However, it is a wider problem for the non-proliferation regime itself and so one of the most pressing issues in global politics. The US government had stated that it will not allow North Korea to develop an ICBM, or intercontinental ballistic missile, but now that it clearly has, US response is not clear. It would appear that Washington will fall back on old policies such as economic sanctions that have had little impact so far on North Korean decision-making. China has the most influence with the North Korean leadership, but it is not clear whether China is able to convince them to moderate their stance. But China’s stance will be important, because with Beijing assuming the UN Security Council presidency in July, that could somewhat restrict the US’s options with regard to North Korea. At the G20 in Hamburg, Xi Jinping and Vladimir Putin are discussing a series of steps regarding the Korean peninsula situation, but their feasibility is questionable. While Xi and Putin agreed that North Korea must halt nuclear and missile tests, they want to see the US and South Korea freeze the joint military drills as well. Of course, North Korea’s nuclear doctrine and military doctrine in general, and its military behaviour, are the most important factors in the threat of escalation in the Korean peninsula. The threat becomes serious whenever nuclear weapons are involved because the consequences are too horrible to contemplate. Though states are very careful about escalation, there is always the chance of it happening due to inadvertence or even accident. The other serious problem in the North Korean case is the question of whether the leadership is even rational. It is possible, of course, Kim Jong-un’s behaviour is an elaborate ploy at creating deterrence by scaring others; a North Korean version of Nixon’s madman theory . On the other hand, if he is truly as irrational as his behaviour suggests, the problems that the region faces are much more serious. The North Korean problem represents a serious challenge to the international community. Given its nuclear capabilities, a military solution is not on the cards, which makes diplomacy the only real option. There have been diplomatic efforts to deal with the situation, specifically the six-party talks, which have so far not been successful. That does not bode well for future efforts, especially as tensions between key interlocutors such as US, Russia, China and Japan have risen over this, as well as other bilateral and multilateral issues. If North Korean nuclear and missile program is not contained, one likely consequence is that all the countries that are threatened will move towards developing defensive capabilities such as missile defences. The issue of ballistic missile defence (BMD) in the context of the US deploying the THAAD system in South Korea, as well as expanding US efforts to develop more capable BMD systems to deal with North Korean missiles, also impacts the deterrence equations between the US and China. Therefore, one of the consequences of the US, Japan and South Korea developing missile defence is that China and Russia will also feel the need to develop their own. So there is going to be potentially a missile defence race, as each party tries to ensure that they are not left behind in a critical area of technology. This will have destabilizing consequences. One is for nuclear deterrence relationships between the major powers: US, China and Russia. These deterrence relationships are based on mutual vulnerability. Moving towards missile defence will undermine this central plank of nuclear deterrence. The importance of mutual vulnerability and the fear that one side might develop a strategic technological advantage was the reason why the ABM Treaty was negotiated in the late 1960s. China has repeatedly opposed ballistic missile defences for this reason. It might be time to revisit the possibility of developing a wider ABM Treaty-like instrument in order to avoid a new missile defence race. In fact, it is not even clear what will be more destabilizing – Japan and South Korea developing nuclear weapons or the question of ballistic missile defences. While the region faces the brunt of North Korean belligerence, it also has implications for the global non-proliferation regime. The regime was generally thought to be in trouble for a number of reasons beyond North Korea. But it has also had some recent success in the Iran nuclear deal. And the fact that countries like India and Pakistan are keen on joining some of the institutions associated with the nuclear order, such as the Nuclear Suppliers Group (NSG), is also a positive development. 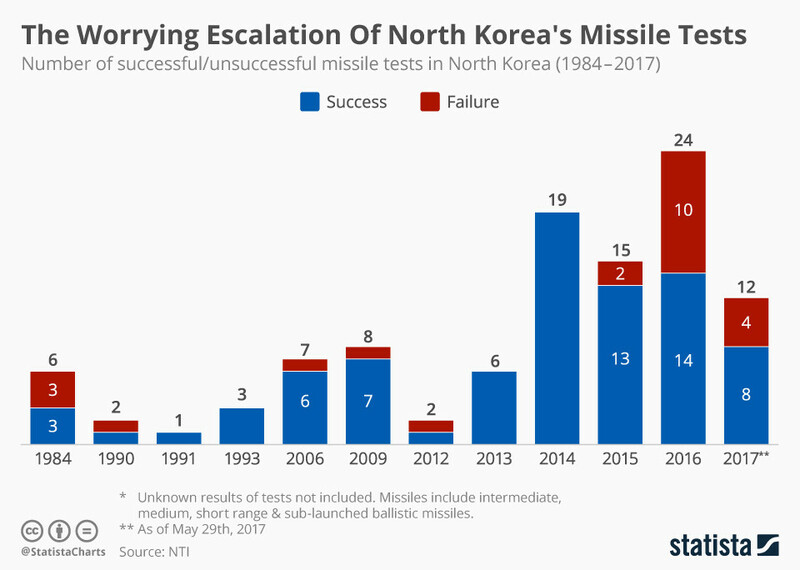 But in the specific context of the Korean peninsula, the inability of the existing non-proliferation regime to take punitive measures against Pyongyang demonstrate its weakness. This has important consequences: The NPT regime’s failure to tackle such cases will leave smaller countries looking for ways to fend for themselves. Its impotence can force other regional powers to look at nuclear options. Japan is a case in point. It is possible that Japan will be compelled to consider nuclear weapons options for itself. Tokyo rightly worries that North Korea’s nuclear- and missile-related issues cannot be sorted out through international arms-control agreements. Though the strong domestic opposition to nuclear weapons is important, the indication that the rest of the world will not do much to control North Korean nuclear weapons and missiles is increasing support for a Japanese nuclear arsenal, though this is not yet the majority view. Therefore, unless the global nuclear community is able to denuclearize or deter North Korea, Japanese domestic opinion could continue to swing towards nuclear. South Korea has also begun to debate nuclear weaponization in a more serious manner than ever before. Following the fourth North Korean nuclear test in January 2016, there has been an intense domestic debate led by representative Won Yoo-chul, the National Assembly floor leader from the Saenuri party, who made a strong case for South Korea to “think about our own survival strategy and countermeasures that include peaceful nuclear and missile programs for the sake of self-defense”. While this is not the first time that Seoul has contemplated such options, this time around the overall public support, as well as from the media, appears to be much greater. But there is an even bigger problem. This is not the first time that the nuclear non-proliferation regime has been put to test – there have been numerous instances in the past where the regime has been faced with a crisis. A few years after the NPT came into force, India conducted a nuclear test. Then, in the early 1990s, Iraq came very close to building a nuclear weapon under the very noses of international inspectors, which was discovered only after it was defeated in the 1991 Gulf war. But on each past occasion, the major world powers were able to come together and build the necessary consensus to close the loophole in the system. In response to the Indian nuclear test, the NSG was set up. After revelation of Iraq’s cheating, the rules of nuclear-technology transfer were changed to full-scope safeguards. These moves required consensus among the key players. Today, however, the situation is very different. Strong disagreements between the US, China and Russia are making it very difficult for the regime to work successfully. This disagreement is not specific to the nuclear domain of course, but spread across a number of issues from trade to specific crises such as the Syrian civil war. Thus, effective tackling of cases such as North Korea will need great-power consensus as the first major requirement; so long as there is no consensus among major powers, the regime will continue to suffer.